Before reading this tutorial, make sure you have read the How to use our PIC Tutorials page! The circuit on a breadboard. This tutorial will demonstrate an LED sequencer. The LEDs will turn on one after another from right to left. With this tutorial you will become familiar with the bit rotate function. One remark needs to be done for the above circuit. 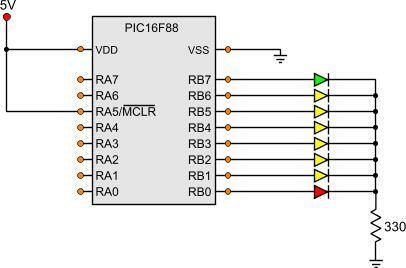 There is only one limiting resistor for all 8 LEDs. Normally this would be wrong. A limiting resistor should be added to each LED separately to ensure the same brightness for all the LEDs no matter how many are turned on. But because only one LED is turned on each time, there is no need for separated resistors. When all steps are done, the loop will run again from the beginning. Notice the 'call Wait500mSec' instruction between each step. This instruction will create a 500 mSec delay. The subroutine 'Wait500mSec' is located inside the header file 'mSecDelays4MHz.inc' that is included in the project. As always, all files needed for this project can be found at the bottom of the page. There full bunch of errors in the codes, i corrected the code, and compiled it, if you want the code, contact me thanks!